This egg salad is also light on the mayonnaise and extra vegetables so the dill flavor really shines. What makes this egg salad special? First, the fresh dill. I love fresh dill and the delicate flavor it adds. The mustard in this egg salad is whole grained. The whole grain mustard I used is somewhat like Dijon, but the seeds are not completely ground so that the mustard has some texture. I love the extra pop of flavor when biting into a seed. Normally, when I make egg salad, I roughly chop the eggs toss in the mayo, mustard, and veggies such as onions, celery, and/or pickles. In this case, I used a Microplane grater meant for Parmesan cheese to achieve a smooth texture. Finally, the mayonnaise ratio in this egg salad is really small, which makes this extra "eggy." So good. Do you have company coming for lunch? 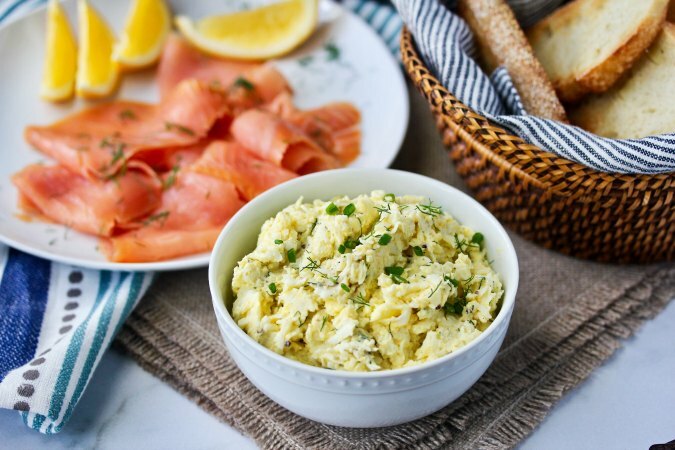 This egg salad is also wonderful paired with thinly sliced smoked salmon and toast for tartines. French in origin, tartines are essentially open faced sandwiches with a fancy name. I'm a big fan of fancy names! You can use any kind of pain grillé (toast.... keeping it fancy) for tartines. I used sliced pain au levain for the toasts. I also recommend using a 40 percent whole grain bread for slicing and toasting. A good rye would also be amazing. These egg salad tartines are wonderful for entertaining at lunch or tea. I garnished the egg salad with a bit of chopped chives and a little extra dill for "looks," but it's not necessary. 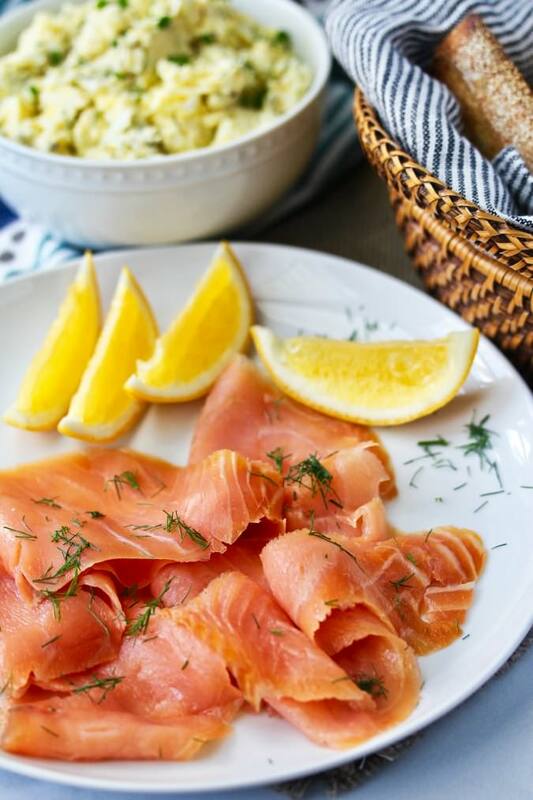 Top a piece of toasted bread with thinly sliced smoked salmon and spread some of the egg salad over the salmon. Garnish with finely chopped chives or more dill. 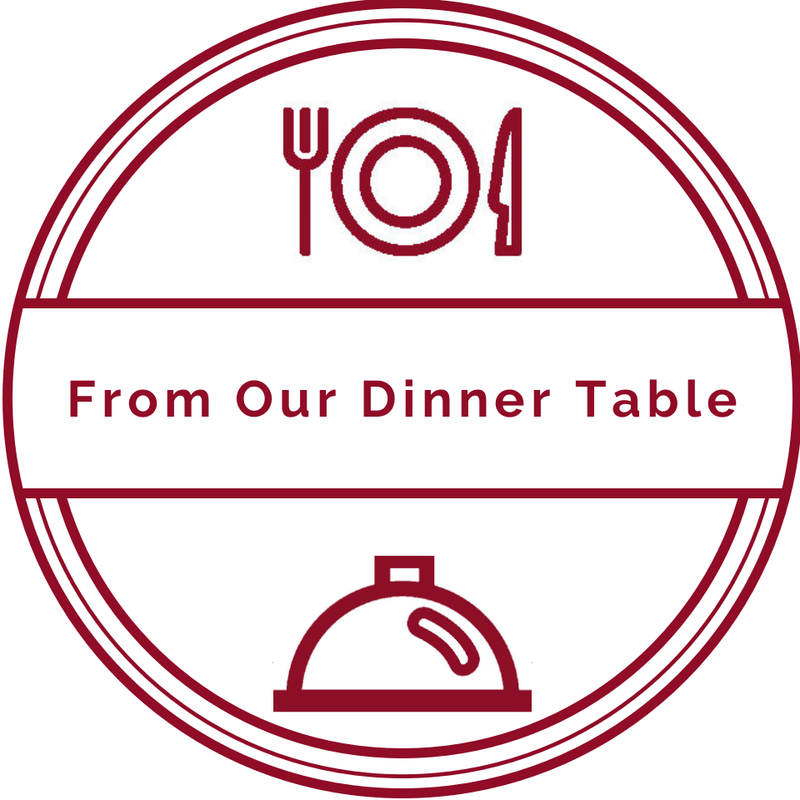 This week, From Our Dinner Table is bringing you Egg-straordinary egg salad recipes. We figure you might need some egg salad recipes after your Easter Egg Hunt. After all, the kiddos are probably only interested in the candy, right? Finely grate the hard boiled eggs and add them to a medium bowl. Add the mayonnaise, mustard, dill, salt, and pepper. Mix with a fork. Garnish with more dill and a sprinkling of optional chives. Toast or grill the slices of bread. 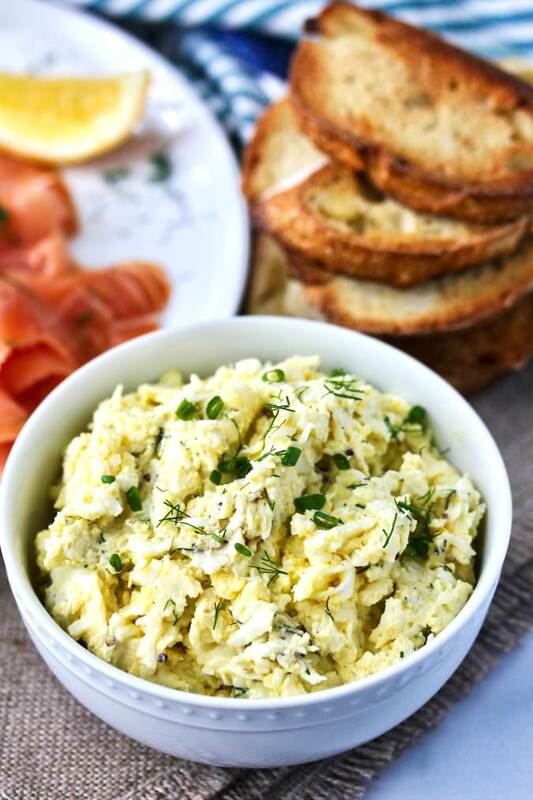 Lay some salmon on the bread, spread on some of the egg salad, and garnish with dill and chives. 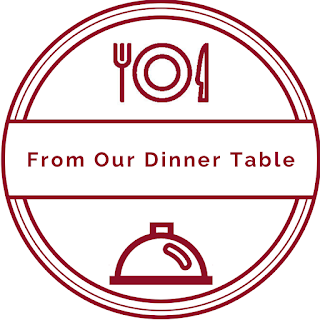 This recipe has been adapted from Barefoot Contessa at Home, published in 2006. I'm a huge Ina Garten fan, and have all of her books. Great minds once again Karen....It's a little scary how often we are on the same page for these events. I thought the smoked salmon was great with the egg salad. I think it's because we are both brilliant! I love that you used dill. 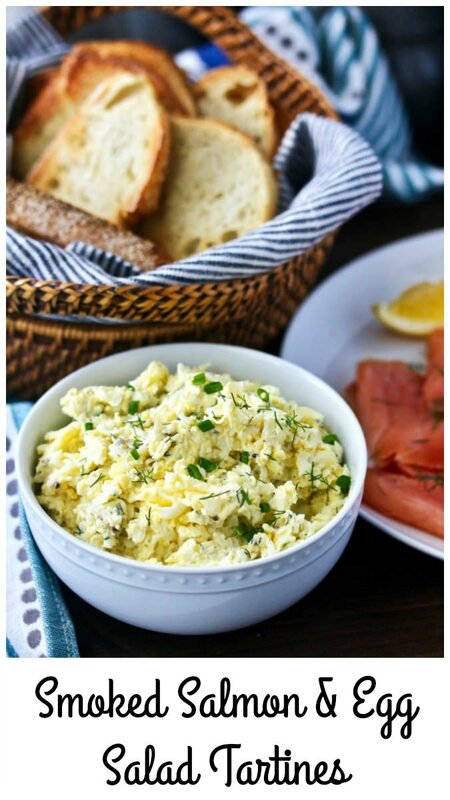 Dill goes so well with eggs ans salmon! I love dill with eggs. I usually add it in my scrambled eggs, but now I want to try it in your egg salad. This is such a wonderful feast and so perfect for Mother's Day! My mother-in- law would love this! She loved salmon! It definitely would be perfect for Mother's Day. I bet smoked trout would be fabulous too!